Beautiful sunshine and cool; just the way I like it. I still haven’t made a real plan for Kyoto, and maybe never will. Just doing whatever comes to mind. So I decided to go to Rengeji, a temple that’s almost into the mountains north of Kyoto. I took two buses and a train, then started walking. This was another one of these ‘on faith’ trips. A sign at the train station said it was 350 meters across the bridge. It never said which fork in the road. I asked five people about the temple before I found someone who knew it. Not a good sign. I was going there because my artist friend, Jacqueline, told me about it and sent me a wonderful video with pictures of the garden. Frommer’s said it was small, but elegant. It was small and maybe I don’t understand what elegant means. I have to look at the video again. Maybe I was in the wrong place, or maybe pictures do lie. Going to the train station I noticed a large temple with interesting trees showing above the walls. I decided to walk back that way when I returned. As I was walking I passed the Falafel Garden, a genuine Israeli restaurant here in Kyoto. Lunch was a wonderful, vegan experience. Then on to the temple, but I never found an entrance. However, they are supposed to have a crafts market next week. I’ll try again. Back on the bus this time to Shokoku-ji. Visitors could go to their museum and three of their other buildings, but the garden with the wall around it was closed. 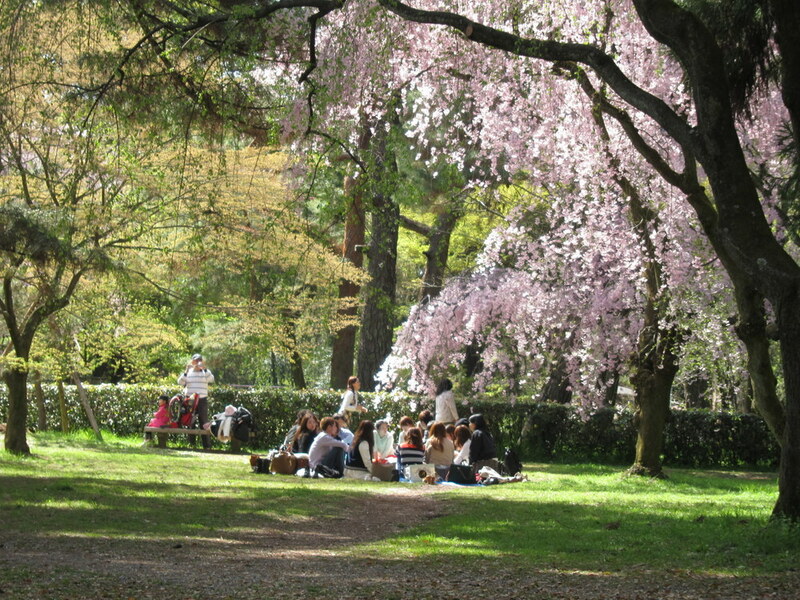 Thoroughly disappointed I walked back to the Imperial Palace and sat and watched other people picnicing under the cherry blossoms. 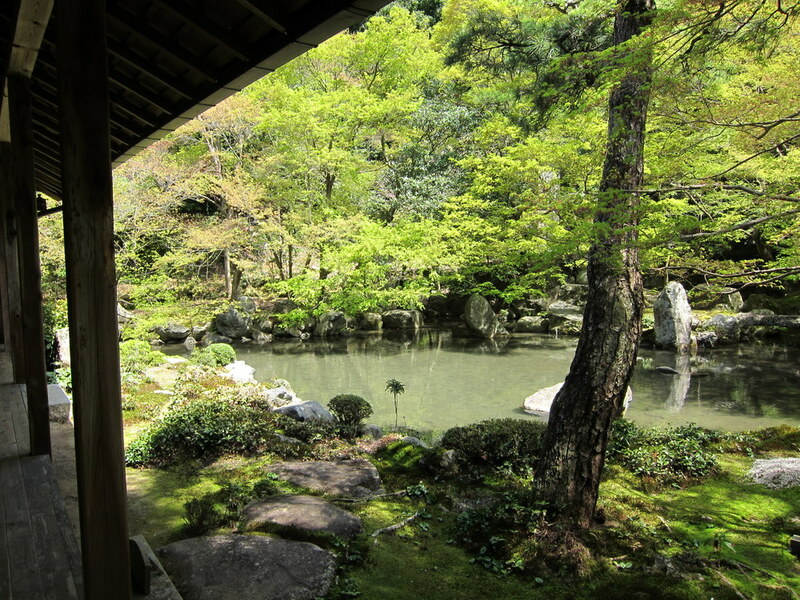 Then I arranged for a tour of the Sento Palace garden (next post). After a nice rest back at the hotel I went foraging for dinner: inari sushi again and some salad. This entry was posted in Garden, Japan, Japanese Gardens, Photography, Walking by ruthek. Bookmark the permalink. Thank heavens for that Israeli restaurant. Doing whatever comes to mind often results in surprises like that. 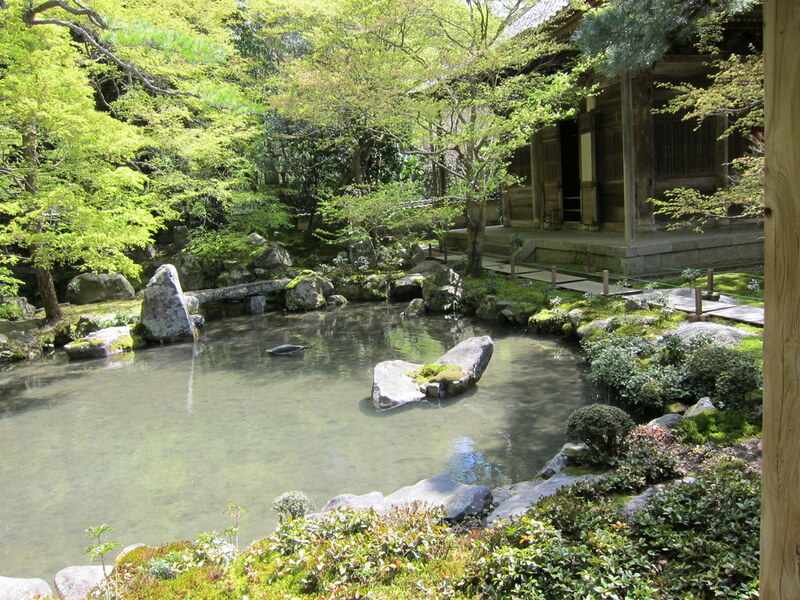 You seem to be having better luck in Kyoto with food but worse luck with gardens. Yes, that first garden is elegant.